It often seems like there's an overwhelming amount of hatred and cruelty in the world. Yet every year I interview young women (and men) at the GlamourGals Glammy Scholarship Awards who represent the opposite: They exude such poise, compassion and excitement to get out into the world and make a difference (and they're already making a difference!). This year's ceremony, on Saturday, May 19, was special because it took place at Goddard Riverside Community Center on the Upper West Side with local seniors in attendance. Connecting different generations of women is what GlamourGals is all about. The nonprofit encourages teens and college students to visit senior homes and provide makeovers to the elderly there. These volunteers (in chapters all across the country) are part of a movement of young people who value giving back—and they see firsthand the effects of elder loneliness. Clockwise from left: Alicia; Rheana; Rosalie, the Inspiration Glammy winner; Hafeezat; and Gretta. "After being involved in pretty much every sport you could list, I had a spine fracture my freshman year and spine surgery my sophomore year. It was pretty much a two-year ordeal. Being only 14-15 years old, that really rocked my world. That was right before [I started a GlamourGals chapter] and I felt like I was really searching at that point. I felt like I didn’t know what grounded me. I thought it was in my appearance and my athletics and trying to strive to be the best, and I had to step back. That’s what I’ve been trying to figure out since and I think GlamourGals has really helped me with that. Compassion and giving and living in the moment, that’s kind of what keeps me grounded now. Knowing that it’s all going to work out and I can love on other people, that’s all that matters." "GlamourGals helped me to break out of my shell. At first, it would take me a good 15 minutes to approach a senior at a makeover. It became easier over time and I was able to be myself. Now I can talk to the seniors about anything. I’m happy that they feel the same way, because some of them are shy, too. I’m still shy, but being in GlamourGals has taught me I don’t have to do what everyone else is doing. I can be different in my own way. Even getting this award today—GG has truly helped me become a different person. It’s helped me to become a leader in my own way." "I fell in love with the art of helping others and how special the residents of each nursing home are. I read a quote online that said, ‘The best classroom is at the feet of an elderly person.’ I enjoyed working with the elderly so much that I got a job at a senior home. After I graduate college I plan on going to medical school and specializing in geriatrics." Above: Special guest Poppy King, beauty entrepreneur and founder of Lipstick Queen, doles out tips on "finding your power lip," encouraging girls and women at the event to step out of their comfort zones and try new lipstick that could make them feel fantastic in their unique beauty. "This year we brought the event to one of the senior communities we visit on the Upper West Side. I think, as a growing organization, it's important to stay true to our mission and vision. The decision to include seniors in this special day demonstrates just that." "What they’re doing is very important. If you can help somebody feel better about themselves, their day, their life—that somebody cares about them—or just make them feel pretty for a minute or so. These are wonderful things that these young women are giving. And when you give, you get." 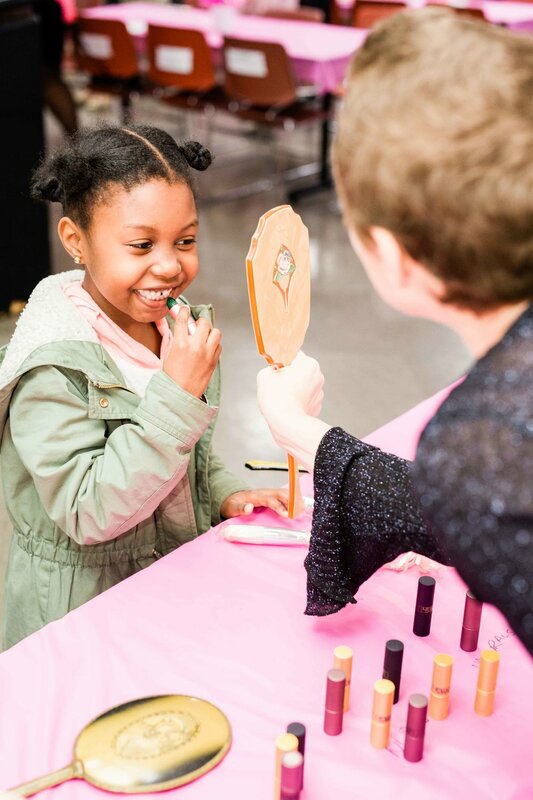 "GlamourGals [embodies] the whole reason I wanted to get into the beauty world—to bring all ages, shapes and sizes together and help women to feel capable through makeup. In a world where young and old people feel increasing isolated, despite social media, the realness of GlamourGals reminds us that liking an Instagram picture is nothing compared to being with someone and sharing true intimacy and life."